These low carb chocolate peanut butter candies use coconut oil and 3 other ingredients for a tasty low carb treat. I’ve been making these on and off for years. Lately I’ve been really trying to stick to a low carb diet and took the time to think about the things that make me fall off the wagon and it’s always sweets. I just love them. I figured I need to find a low carb ice cream (Breyers CarbSmart), cookie recipe (coming soon) and a candy recipe that will satisfy me and still be low carb. That’s when I remembered these candies. They use coconut oil, raw cacao, PB2 (a peanut butter powder) and splenda. If you don’t want to use artificial sweeteners (Splenda) you can use sugar, coconut sugar, maple syrup or honey instead. These are great because you get all the health benefits of coconut oil and raw cacao and still get a tasty treat when that sweet tooth starts calling your name. This takes only a few minutes to make. You basically melt everything in a pan and then pour into candy molds. 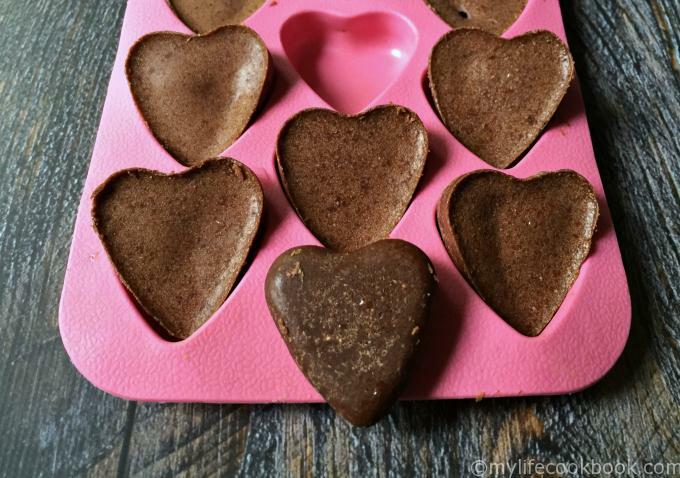 I poured mine in little heart molds I found at the dollar store and store them in the freezer. I pop one in my mouth whenever I want, but take it form me, you can’t really sit down and devour a whole bunch of them. The coconut oil is really filling. They will fill you up for hours. People on low carb or keto diets call these fat bombs. Their high content of healthy fats keep you in ketosis or fat burning mode and have the benefit of tasting good. That being said you shouldn’t eat a bunch of them. One or two for a snack is perfectly filling and satisfying. Of course you’ve probably heard about all the great health benefits of coconut oil. I won’t go into that here because there is plenty to read. (Google “the benefits of coconut oil” and you will get 8,730,000 hits!) Here’s an article about the 10 Proven Health Benefits of Coconut Oil if you want a quick read. These have been helping me satisfy my sweet tooth and curbing my appetite and they just taste good. I hope you like them as much as I do. You an even mix it up a bit and add a few nuts to the candies if you want or forgo the peanut butter powder and use a drop of mint flavoring for a chocolate mint candy. Oh yeah and they are only 0.8 net carbs per candy. Not to bad. Enjoy! 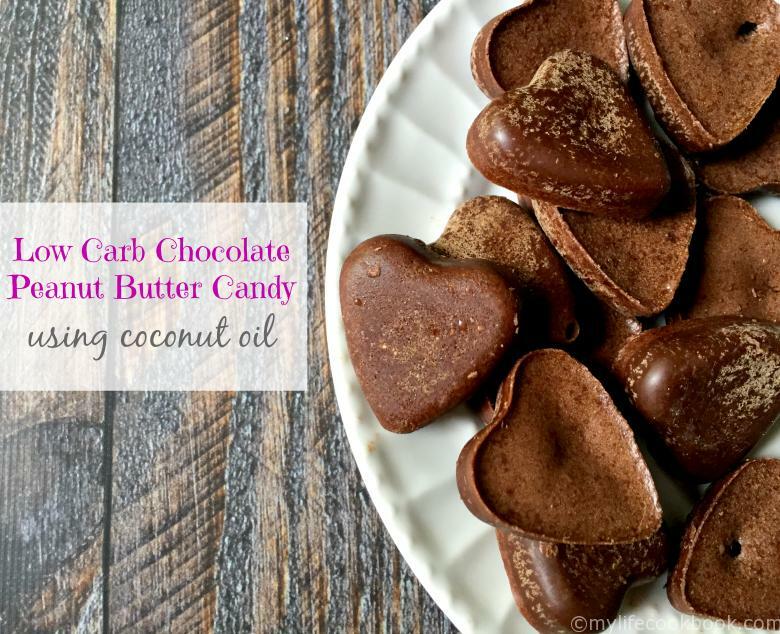 These low carb chocolate peanut butter candies use coconut oil and 3 other ingredients for a tasty low carb treat. 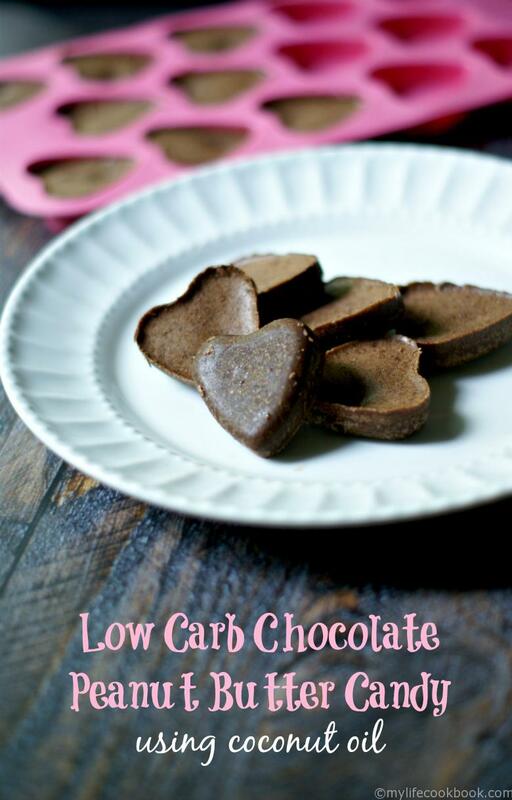 Perfect chocolate Paleo snack. Melt the coconut oil in a saucepan. Add the other ingredients and mix well. Do not boil. Pop out of molds and store in the freezer or refrigerator. Previous Post: « Quick & Easy Mexican Bean Salad – perfect side dish for picnics and parties! I’m pretty sure I need these in my life. 😉 Thanks so much for sharing them at Savoring Saturdays, Denise! 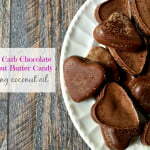 I make peanut butter cups similar to these and the kids love it. Will have to try your version. They really are! I eat them all the time. I miss fruit the most when I am low carbing it; however, I do get the occasional chocolate craving. This is such a great little snack when those cravings sneak up. I also love that you can make them in fun little shapes. Too cute! Thank you! Yeah I miss fruit too but for awhile I’ll have to go without.Though I’d take chocolate over fruit anyway.